Before asking where, you might ask who is Carmen Sandiego. For anyone not familiar with her, she was a 1980s–’90s phenom, who began her virtual career as the villain in the computer game Where in the World Is Carmen Sandiego? In the game, she is a globe-trotting thief whose criminal hijinks invite a global detective hunt to track her and her henchmen down, based on geography and history clues. And now she’s back! Houghton Mifflin Harcourt (HMH), the publisher and learning company that owns the Carmen Sandiego brand, has partnered with Netflix to bring Carmen to a new generation. In a new animated series that launches January 18, Gina Rodriguez (of Jane the Virgin fame) is the voice of the red-clad adventuress who seeks to defy the ACME agents in hot pursuit. Her partner in crime, a young hacker known as Player, is voiced by Finn Wolfhard (Stranger Things). The reboot consists of the Netflix series, a book publishing program, digital games, and consumer products as well as other educational offerings created by HMH. It aims to bring the exciting character and her world travels to a new and wider audience. A live-action film, to star Gina Rodriguez, is in development and slated for a 2020 release. To help kick off the show’s upcoming premiere, and its tie-in to HMH’s educational efforts, Rodriguez appeared at an event in Miami on January 8. The star hosted a game show quizzing students on their geography skills. A group of 1,700 students from select elementary and K–8 schools in Miami-Dade County, many sporting Carmen’s iconic red fedora, gathered at the Adrienne Arsht Center’s Knight Concert Hall. Student teams competed on stage by answering geography questions on landmarks and capitals from around the world. The original Where in the World Is Carmen Sandiego, released in 1985, was one of the most successful educational software products ever created. Millions of people, both young and old, have used the computer/video game to learn about places around the world and the landmarks, monuments, or cultural objects that make them unique. The game requires geographic knowledge, hints of which players can obtain from bystanders in the places they visit to investigate the heists. As players interpret clues correctly, they try to find and arrest Carmen—who is always one step ahead of the chase. Silly humor and word play, such as rhymes, puns, and alliteration, are a consistent, endearing feature of the video game in its many variations and spin-offs, which included an animated series and two TV game shows for kids on PBS. With Netflix set to launch the reboot of Carmen Sandiego, actress Gina Rodriguez pitches the show’s educational value to students in Miami. 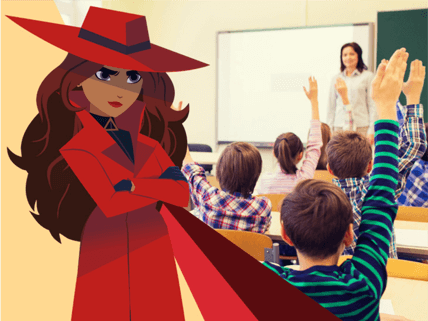 In partnership with Netflix, Houghton Mifflin Harcourt offers a host of new resources featuring the elusive superthief Carmen Sandiego and teaching geography: books, card games, puzzles, digital resources available for download—and merch! Netflix’s new animated series features the elusive red-clad “superthief” who “only steals from other thieves”—and teaches the viewer some geography and history while doing it. Five-star review of the new Carmen Sandiego animated series on Netflix. Review of the new animated series on Netflix highlighting aspects that update the show for a new audience.